Agumbe Rainforest Research Station is located smack in the middle of Agumbe Reserved Forest – now a designated World Heritage Site - in the state of Karnataka. It is a picturesque yet an unpretentious outfit – seems straight out of a movie. Built on a small clearing amidst the surrounding dense forest, the station is but a small set of quaint, comfortable cottages that survive on a sustainable solar and hydel power system. It was set up in 2005 by the world-famous herpetologist Romulus Whitaker to encourage field studies in rainforest ecology. Seven years on, King cobras, grey langurs, leopards, lion-tailed macaques outnumber the researchers at the base. Agumbe receives some of the heaviest rainfall in the world, which, together with its topography and the density of forests, has made it conducive to different species of snakes, particularly the King cobra - the longest venomous snake in the world. 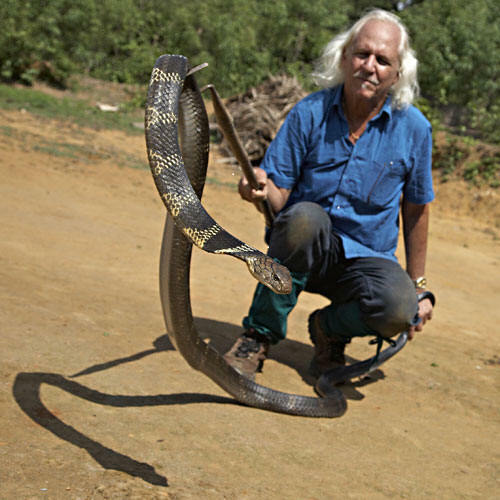 Rom Whitaker, popularly known as the snake man of India, has been working with reptiles here since the 1960s. His fifty years of work in India is the stuff that great narratives and legends are made of. The story begins long before his arrival in India. To Rom Whitaker, hunting snakes has always been a passion. He caught his first snake when he was just four. This was in the country estate that he shared with his mother and sister in northern New York State. Although scared of snakes, his artist mother encouraged him tremendously and soon he started bringing home garter snakes and milk snakes. Then came the Big Move. In 1950, Rom's mother married an Indian gentleman and moved the family to Bombay, India when Rom was seven. For the next ten years Rom went to a boarding school up in the mountains in the south, in India's favourite biodiversity hotspot, the Western Ghats. Weekends were spent hunting snakes in the surrounding jungles, while weekdays were spent looking after a 12 foot python that lived quietly under his bed at the dorm. Somewhere in between the two activities, he attended classes.